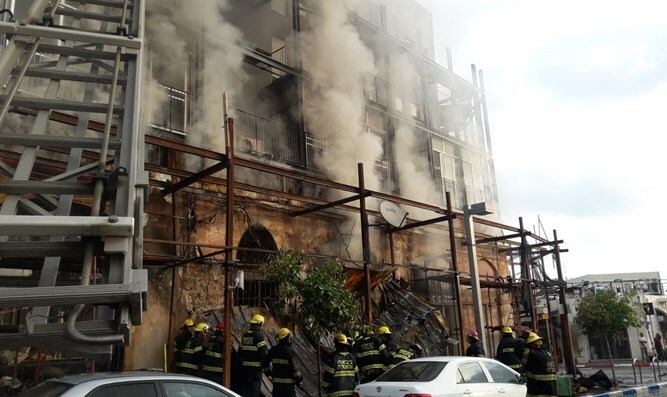 Fire breaks out on ground floor of building in Jaffa after 3 am. In addition to man who was killed, another man was apparently present. A man was killed in a fire that broke out last night in a shop on the ground floor of a building in Jaffa. Firefighters operating at the site are searching for another man who apparently was present during the fire. The fire broke out shortly after 3 am on the ground floor of a three-story building. There was no one at the time of the fire on the two floors above the store, as these floors are currently undergoing renovations and the apartments are not occupied. Security and rescue forces continue searching for the missing person. Police said the building is feared to be susceptible to collapse as a result of the fire.